Took off on patrol from Ascension Island at 0623. After being out five hours and having turned to the homeward leg, I decided to transfer fuel from the outboard wing tanks. This requires that the radio and radar be turned off. At 1110 while transferring fuel and passing through a small front with base at 1000 feet, I was flying at 3500 feet on course 0680 T, position 10-09 S and 18-00 W, when the bow watch reported the sighting of a ship through a break in the clouds, at which time the co-pilot and myself sighted the same object at about five miles, two points off the port bow. I said, "Heck", that's a Nazi Submarine", which sent everyone to battle stations. Radio was turned on and by that time we were just coming into the clear, still at 3000 feet. I sighted the sub again on my port beam, distance one and a half miles. The sub was on course 0900 T, speed 15 kts or better. Making a diving turn to port and coming across the sub on his port beam, air speed 250 MPH, altitude 75 feet, I dropped six bombs, one just forward of conning tower. Pulled up and into a steep port bank and began second run. This time the sub was turning about to his starboard and I was unable to straighten the plane out in time and passed the sub about sixty feet inside of his turn. Turned again to my port for a third run. At a target angle of about 60 degrees, altitude25 feet, I dropped the three remaining bombs which were seen to explode short. Then pulling out to port and away, I looked back and saw sub still in his turn and losing a great amount of oil. I was also able to see three puffs of smoke which I believe were the only shots fired at me during my three runs. There was enough personnel top side of sub to man all guns but the reason for the light fire was the excellent shooting of my gunners and the element of surprise. After pulling out I was able to contact 107-B-4 by voice and tell him of the attack and started sending MO's so as to home him in on the target. In the mean time the sub was still losing oil and appeared to be down by the stern steering an eratic course in a southerly direction making about 4 or 5 knots. At 1245 B-4 arrived and I made a strafing run on his first drop coming at the sub from its port side. B-4's bombs were seen to drop short. After B-4's attack the U-boat continued on an erratic course progressing in a southerly direction and returned to the position where I originally attacked him at 1330. At this time the U/B was able to cruise on a straight course and headed west. 107-B-8 homing in on me arrived at 1340 Z and made an attack from the U/B's stern. At about 1000 yards from the U/B smoke started coming from his #2 engine. At the time I made a coordinated strafing run in on the sub's starboard beam breaking off at 400 yards and turning to port. B-8's bombs fell short. Baker 8 then returned to base due to engine trouble. 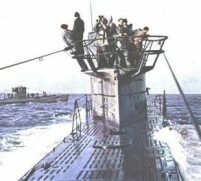 At 1515 the U-boat stopped losing oil and thereafter cruised at 10 to 12 knots for short periods of time. Captain Main of Army First Composite Squadron piloting a B-25 arrived at 1545 and made two bombing runs from 1400 feet. Bombs fell short. Major Atkins of same unit also in a B-25 arrived at 1635. I then left at 1635 and headed for base. At 1642 I met 107-B-4 (Lt. S.K. Taylor) and directed him to the target. At 1700 met Major Orr of the First Composite Squadron in a PBY-5A (US-2) and directed him to target. Landed at Ascension at 1833. PBY-5A (US 2) US Army.107-B-4 - Lt. S.K. TAYLOR. 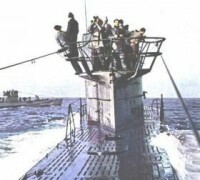 After pulling out of dive and around in position to see the submarine, it appeared to be settling straight down, until suddenly from the conning tower forward, it shot up in the air, and then there was a terrific cone shaped explosion, coming from and surrounding the entire sub, which rose high in the air. As this subsided everything seemed to be swallowed by the sea. The next instant there appeared in the middle of the oil patch a group of men, 25 or 30 in number, three life rafts, and a dark object which looked like part of the broken submarine. The apparent part of the sub soon disappeared below the surface. We then estimated there to be between fifteen and twenty men, part of them in the rafts, part hanging on and others swimming or floating. One of the rafts failed to open and sank. We dropped one life raft. Men were seen to get in it. An Army PBY arrived soon after the attack. Three life rafts were dropped from it. The PBY stood by and sent MO's on 500 Kc while we departed in search of the H.M.S. Fort Cumberland. We attacked and sank the sub at 1700 position 1010 south, 1812 west and found the Fort Cumberland with the aid of radar at 1800 bearing 299 T and 35 miles from survivors. We told ship by blinker of survivors, giving position, bearing and distance from ship and requested that ship pick them up. The ship received the message, but did not say whether or not it would comply. At 1900 we left the ship and homed on the MO's of the PBY back to the survivors. It was getting dark and we decided that there was nothing more that we could do out there. So the PBY and we departed at 1915 for Ascension. We landed, as predicted by the navigator, at 2135. The following information was obtained (1) from the sole survivor of U-848's sinking, but who died three days after being landed at Recife. (the sinking of U-848 was confirmed by the message he scratched on the paddle of his life raft); (2) from prisoners from U-841 who had seen U-848 while at Kiel. On 5 November 1943, a Navy plane out of Ascension Island, sighted a fully surfaced U-boat in position 10.09 S., 18.00 W., and immediately attacked it at 1125 Z. 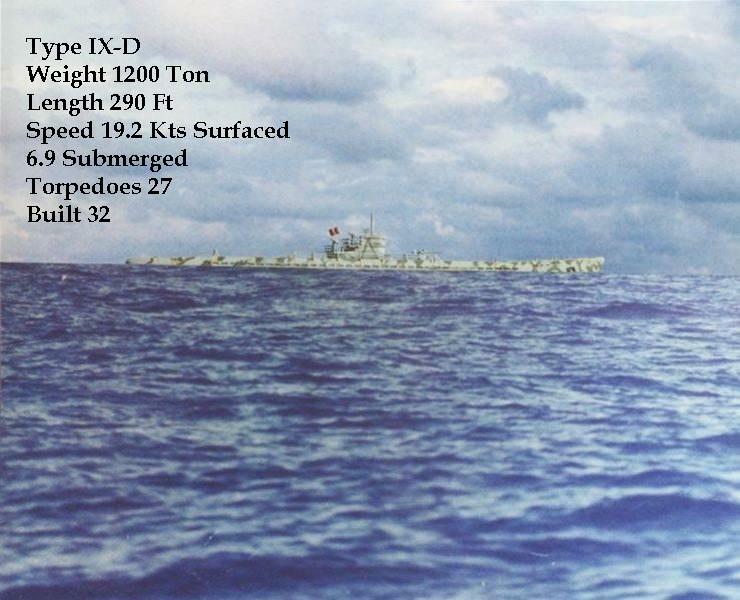 From then on until the boat sank at 1900 Z, 10 attacks by two Army and four Navy planes were made and a total of 33 depth charges and 12 demolition bombs were expended. Twenty survivors were seen in the water after the sinking but were not sighted again thereafter. Attempts were made to divert a merchant ship to the scene of action, but they proved unsuccessful. On 3 December 1943, in position 08.00 S., 31.32 W., U.S.S. Marblehead picked up a lone survivor from an U.S. Army life raft. He was landed at Recife on 4 December 1942, but died on 6 December 1943. Very little information was obtained from him, as he was delirious most of the time.